Florida gardeners look forward to fall with as much anticipation as gardeners farther north look forward to spring. With the exception of a few tropical species such as okra and cowpeas, not much grows in Florida gardens during the long, hot summer. By the time August rolls around, the limitations on what can be planted have begun to loosen up, and by September, we will be able to plant pretty much anything. Although this region theoretically has a year-round growing season, fall is really the time of peak gardening. By way of comparison with northern gardens, August is akin to that period in late winter when the ground has thawed, but frosts are still frequent. September brings the first hint of cooler weather, with the kind of long warm days and mild nights that make garden vegetables thrive. One significant difference that remains, though, is that here the days start out long and then get shorter as the season comes to a close. Because of this, the growth slows down as the season progresses, rather than accelerate. Against the backdrop of this calendar, I have spent these first few days of August clearing out old growth, preparing the ground where I have spaces available, tending to the young plants previously started, and planting more seeds. The first two pictures below show the oldest of my fall plants, an assortment of tomatoes and peppers as detailed in this post. I would like to draw your attention to the two peppers on the far right of the tray in the foreground of the first picture below. Those are Black Hungarian peppers, which produce tasty, medium-to-hot peppers and can be used as ornamental plants. Notice the dark coloration? According to the description when I bought them, they are supposed to have deep purple veins and emerald green leaves. From what I’ve seen so far, it appears the reverse is true. Either way, as they mature, they should produce purple flowers, followed by pepper pods that start out green, turn solid black, and then ripen to red. This is my first time growing any, so I’m looking forward whatever colorful display they offer. 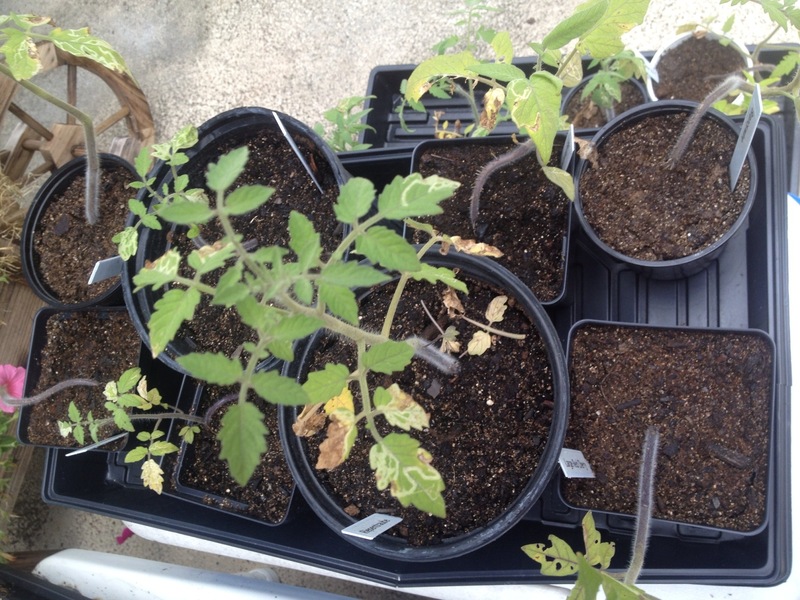 I’m somewhat concerned with the discoloration on several of the tomato plants. I have compared them with tomato disease pictures found in databases, and as best I can tell, these leaves do not match any of the leaves illustrating identified diseases. As such, I will not panic just yet. What I will do is trim them up and move them out of the screened enclosure to expose them to full strength sunlight on a full time basis. 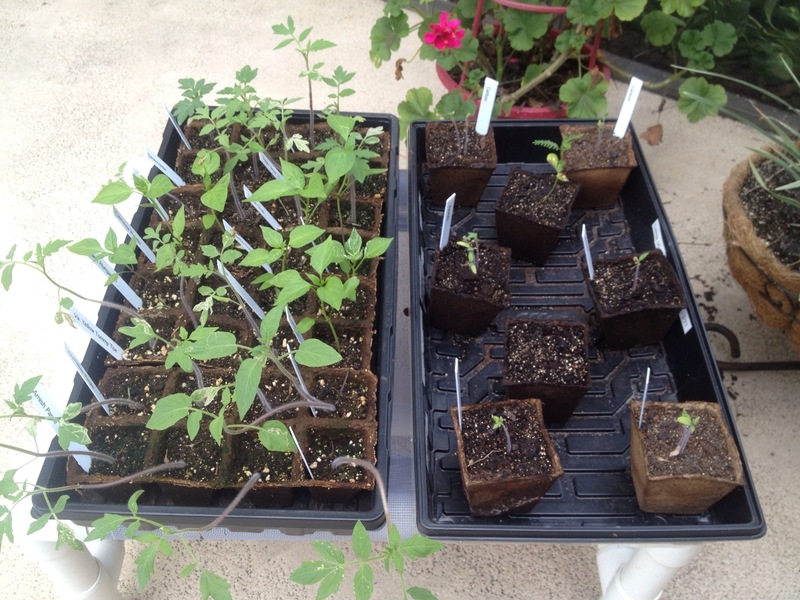 I will also be transplanting them to their permanent homes within the next couple weeks. I am hopeful that this will address the problem. 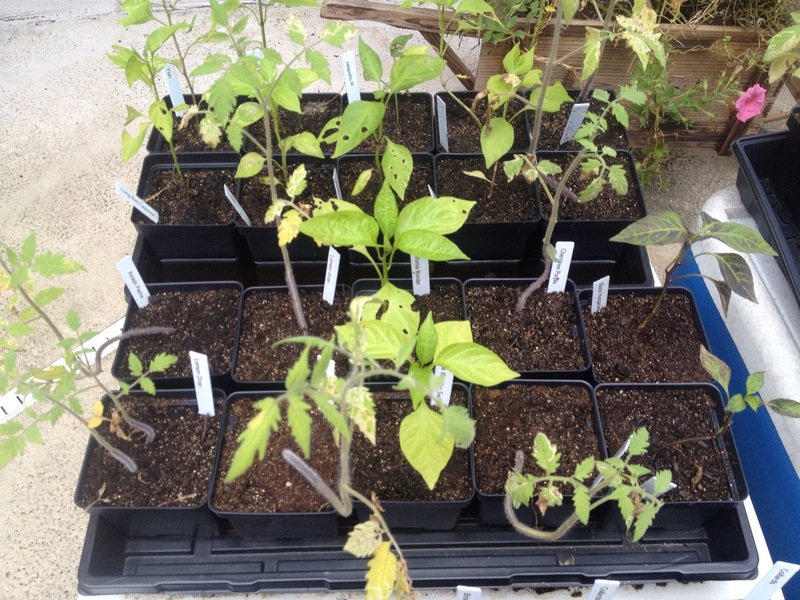 The next picture shows the second and third waves of tomato and pepper plants. The second wave is discussed in detail here, and the third in this post. Careful readers or keen observers might notice that there are a couple extra pots in the right-hand picture. Those are both a type of ornamental tree known as a Jerusalem Thorn. Only one of them has sprouted thus far, and it has been almost long enough to conclude that the second one failed to germinate. Needless to say, these are not intended for the vegetable garden! The next picture marks this fall’s first departure from the Solenacea family, more commonly known as nightshade. 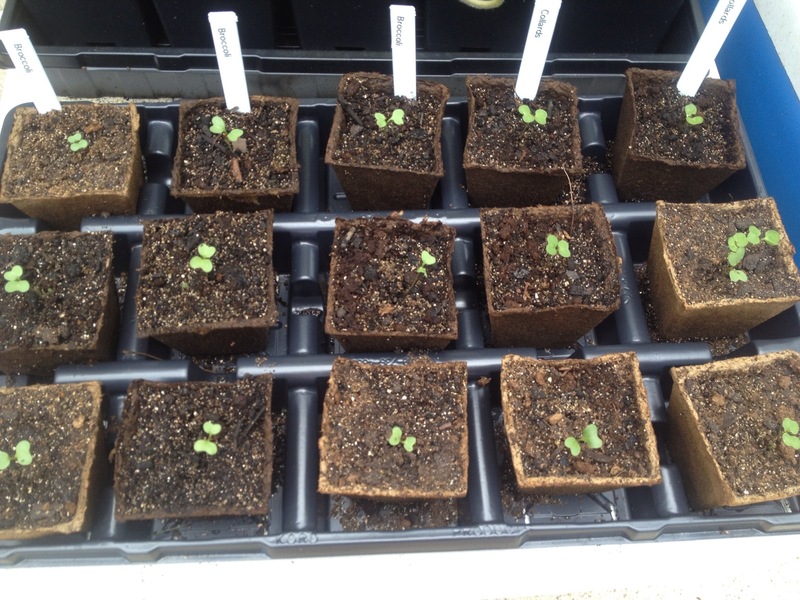 The plants in this tray are members of the Brassicacea family, more commonly known as the cabbage family. In fact, they are all members of a single species, Brassica oleracea. This species has a surprisingly diverse array of cultivars, one of which is cabbage, and within those cultivars, one finds an assortment of varieties. 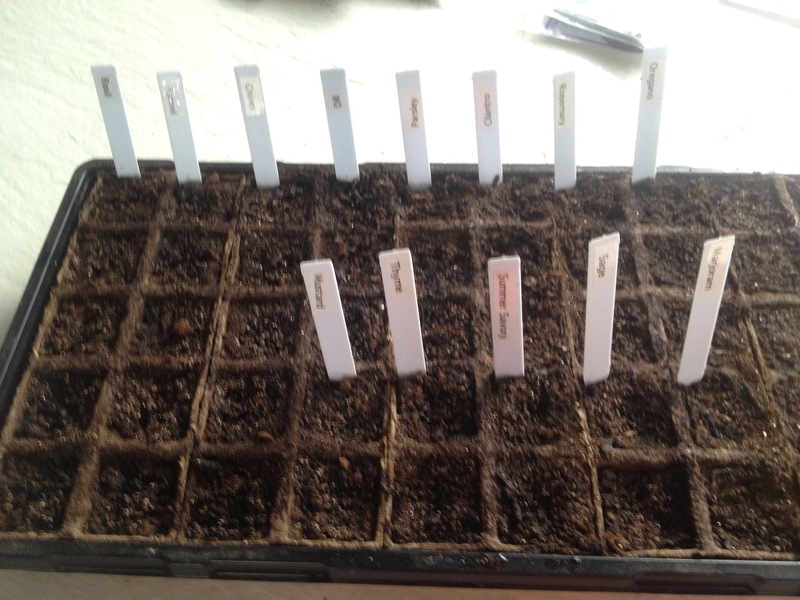 In is tray I have planted one variety each of two cultivars, neither of which happens to be cabbage. Instead, I have broccoli (the DiCiccio variety) and collard greens (the Georgia variety). The nine on the left are broccoli and the six on the right are collard greens. If you look closely, you will notice that they are indistinguishable from one another at this stage.